This week, the U.S. Senate passed the first major banking bill since the Dodd-Frank financial overhaul in 2010. If successful, it would roll back and loosen regulations on banking institutions prompted by the 2008 financial market meltdown. The new bill is the result of a bipartisan effort. More than a dozen Democrats joined the Republicans to pass it. But passage in the House, where it heads next, is not guaranteed as Republican lawmakers there want an even bigger rollback of regulations. The measure, supporters say, will provide regulatory relief for small banks. Meanwhile, critics argue that it benefits larger institutions more by loosening important consumer protection requirements for lending. If it ultimately passes the House and is signed by President Trump, the bill contains three provisions that state and local governments should keep tabs on. Called the Economic Growth, Regulatory Relief and Consumer Protection Act, the bill would change the size of banks that are subject to federal regulatory scrutiny. It does this by raising the threshold for so-called systematically important financial institutions from banks with at least $50 billion in assets to banks with at least $250 billion on the books. These financial institutions are subject to higher regulatory standards than small banks. The idea is to free up smaller, regional banks from the strict scrutiny they say hinders their ability to make small business and other loans. The stingy small business lending market has made it difficult for business owners to expand and grow. This stagnation is something that concerns state and local politicians. Supporters claim the bill would keep consumer protections intact, but some critics contend it would do the opposite. They point to the $50 billion threshold mentioned above, which many have said was too low. Some are concerned, however, that the bill would raise the threshold too high. For example, Countrywide Financial, a major subprime mortgage lender at the center of the foreclosure crisis in 2008, had assets of roughly $210 billion before it failed. Under the proposed bill, it would be exempt from the kind of regulatory scrutiny from the Federal Reserve that it’s subject to today. There's another mortgage-related provision in the bill that has consumer groups like the Center for Responsible Lending railing against it: the proposal to loosen mortgage lending standards for small banks and credit unions. The bill contains a big plus for municipal debt: It would expand a federal rule outlining the kind of liquid assets that banks must hold in case of an emergency to include all investment-grade -- that is, anything above junk status -- municipal bonds. The current rule limits the kinds of municipal bonds that qualify. Many were concerned that the limitation for munis would make it more expensive for states and localities to issue debt during the next economic downturn because demand for them would be lower from banks. The proposed expansion isn’t perfect. The new classification for munis would make them similar in credit quality to mortgage-backed securities rather than on par with debt from foreign countries, which is typically more stable and what finance officials wanted. Still, notes the Brookings Institution’s Aaron Kline, the fix in the bill strikes a better balance than what exists today. Early data for the last three months of 2017 show the strongest growth in state tax revenues in the post-Great Recession period. According to data compiled by the Rockefeller Institute of Government, personal income taxes increased by 16.6 percent over the fourth quarter of 2016 and sales tax collections rose by nearly 7 percent. The institute attributes the activity to taxpayer responses to the tax overhaul late last year, which created incentives for some high-income taxpayers to prepay state and local taxes in late 2017 before certain tax breaks expire. As the U.S. Supreme Court gets set to weigh in on whether to legalize all online sales taxes, some are arguing that leaving it up to the states would result in a patchwork system of online tax laws. Therefore, the conservative-leaning Tax Foundation is urging Congress to pass a national online taxing law before SCOTUS makes its decision. But states are already moving forward on their own. Indiana, North Dakota, South Dakota and Wyoming have already passed laws outright legalizing online sales taxes. 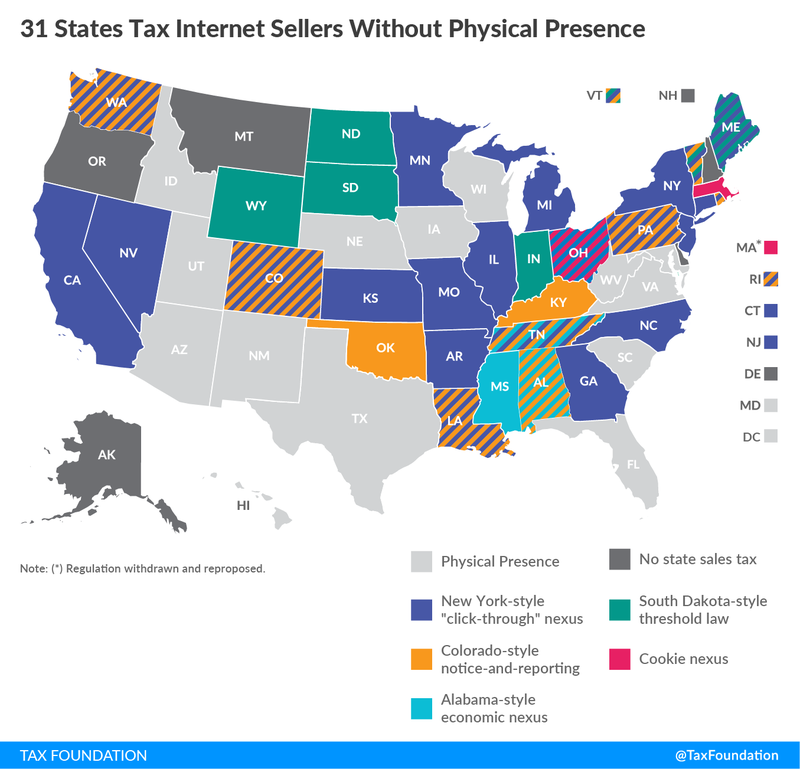 This year, at least nine other states (Georgia, Hawaii, Idaho, Iowa, Kansas, Nebraska, New Mexico, New York and Oklahoma) have similar online sales tax bills in their legislatures. If passed, those laws would replace the more limited, online sales tax regulations that those states have passed in recent years. San Diego State University had to scramble to find money to send personnel with its men’s basketball team to the NCAA basketball tournament this week. That's thanks to California's ban on state-funded travel to states that it says have discriminatory practices. State employees are prohibited from using public money to travel to eight states, including Kansas, where San Diego's game against the University of Houston was held Thursday night. The NCAA covers most of the costs associated with sending a team to the national tournament, but that doesn’t include supporting athletic department or other personnel. San Diego Athletic Director David Wicker said the team would use a private account, plus bonus money the Mountain West Conference provides, to help teams with the cost of the tournament. No California teams in the women’s national championship tournament are impacted by the travel ban.